Editor’s Note: John Bryden, Jr. of the 57th (and later 61st) New York wrote a series of letters from the Siege of Petersburg in 1864/65 to his wife Sarah at home. 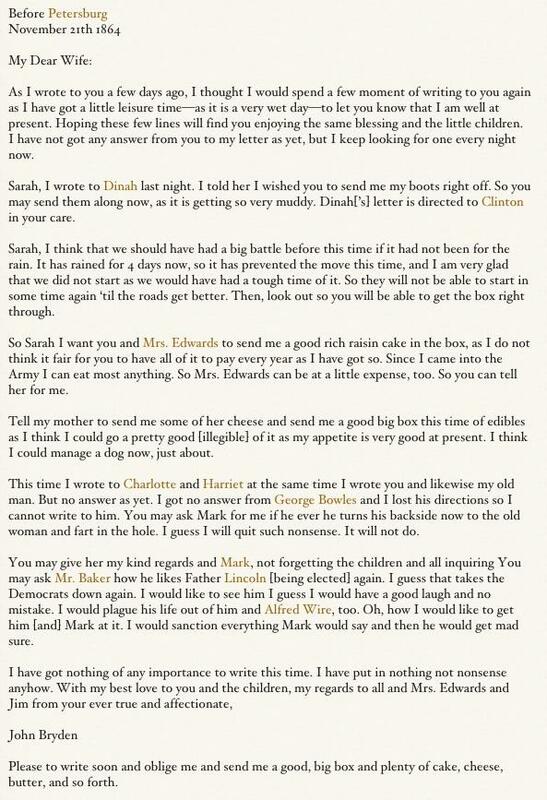 These letters were placed online in 2009 as a part of the web site My Dearest Sarah, a collection of the letters of John Bryden to his wife prior to and during the Civil War. Bryden’s descendants John (father) and Heather (daughter) Bryden made the appearance of these letters at The Siege of Petersburg Online possible, and I thank them greatly for their cooperation. The transcription of the letter which appears on this page is copyrighted by Heather Bryden as a part of her web site and may not be reproduced without her express written consent. All rights reserved.